Utilize the natural surroundings with a picnic lunch on our Ridge Patio, enjoy a day of ice breakers and ropes course activities on our Adventure Course, or treat your guests to a relaxing banquet in front of one of our fireplaces. Plan your own schedule or let us fill your day with fun and productive activities – we can help you customize the day to fit your needs. All of our facilities feature Wi-Fi and AV capabilities. Lang Lodge features three large meeting rooms and two classrooms that provide plenty of room to spread out and generate creativity. Depending on seating arrangements, our Great Room can accommodate up to 140 at round tables. This facility also features four community dormitories for overnight retreats and can accommodate up to 70 guests (available August-May). 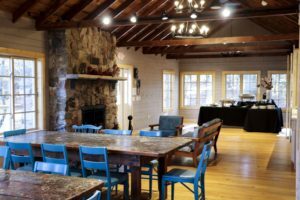 The Peggie Stone Center features a Fireside Room with a field stone fireplace, Lakeside Room with stunning views of Pickerel Lake, and an outdoor deck. The facility can accommodate up to 50 guests, and a four hour rental starts at $175. 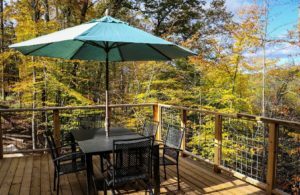 New in 2019, the Health and Leadership Lodge features a meeting space for up to 20 (with built-in AV), a deck overlooking the Wetland conservation area, and nine private rooms with bathrooms for overnight or weekend retreats. Each room contains a queen sized bed and is perfect for weekend planning meetings, retreats, and more. 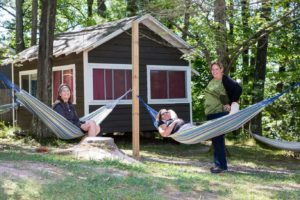 Rooms start at $95 and are available August-May. A four hour rental of the meeting space is $175. Ridge Specialties Catering provides meals, hors d’oeuvres, beverages and more for all-day or weekend retreats. We can also create custom menus for your retreat that will fit your budget.